The story of how the Irish team sport of Hurling is spreading like wildfire across the United States. The book examines how to play. 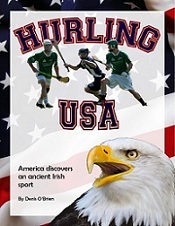 It explores hurling’s ancient legacy, early American years and what Irish America has been missing for generations. And, why today, from Florida to California, Americans are getting “hooked” on the sport. Readers follow a trail to Mesopotamia, Egypt, across Europe and Canada to sample ancient stick ball games. Hurling’s Irish roots are traced in myth, law, iconography, history, lecture and fascinating first-hand accounts of old matches. In the middle of the 19th century, hurling arrives in America with immigrants and prospers in the big cities until squabbling, assimilation, depression, war and exclusiveness see it fade into the background of ethnic entertainment in place to this day. ‘Hurling USA’ goes on to outline exactly where, how and why the sport is growing on college campuses and on American public parks. The author brings into focus the hit-and-miss Irish summer player model adopted by older ex-pat clubs in big cities in comparison to steady growth at new hurling clubs. In the concluding chapter, he examines what hurling’s growing presence could mean for the sport’s governing body in Ireland, the Gaelic Athletic Association (GAA), Irish immigrants and the American sporting landscape. Denis O’Brien is a Freelance Journalist based in the North West of Ireland, in the town of Ballinamore, in the County of Leitrim. He is writer, producer and publisher of the popular podcast, GaelicSportsCast. GaelicSportsCast reports on Gaelic Sports news around the globe via daily and weekly podcasts as well as written reports. Mr. O’Brien is a former emigrant himself as he spent almost 20 years in America, where he lived in New York and more recently in Boston. Since returning to Ireland, he has worked as a Freelance Reporter and later as a Staff Reporter for the former Leitrim Post newspaper. While in America Mr. O’Brien reported Gaelic Sports news from Boston with weekly blog and local newspapers publications. He has written for the Boston Irish Reporter, the New York Irish Examiner, contributed to the Irish Examiner, Leitrim Observer, Anglo Celt, The Sligo Champion, Sligo Weekender, Donegal News, Shannonside Radio, and Ocean FM Radio.